Polls are open until Thursday, April 10 at 11:59 PM EST. Enjoy! I was about to put down Mega Man 2. I love the music, the levels, the gameplay. But then I remembered my experience with Super Metroid (after i played some of the Primes) and it was like a Prime game in 2D. It wins out. SMG2 over Melee because I thought Brawl was better than Melee. Super Metroid versus Mega Man 2 was a tough call. I've spent more time with Mega Man 2, but Super Metroid is probably one step closer to being flawless. Looking forward to seeing who'll end up winning this full bracket. Man, that second one is tough for me. "At the time" I'd probably pick Melee, but I also am one of those crazy people who think Brawl topped it, and Smash is the kind of game that once it is topped I have no interest in going back to. Galaxy 2, on the other hand, is just plain awesomesauce. This round has been very easy so far. Galaxy 2 is a really fun, creative game and everything...but Melee is like....90% of my Gamecube playtime. The game was that good. It was a game that just SURPRISED me when it came out. I had no idea they were going to go all out like they did. It was the first time that we got to see our Nintendo characters in 3D, and they didn't look like a blocky mess. It was just a shocker on all fronts. Mega Man 2 is no slouch, but it's made less special from there being so many of those games. Melee is still my fave game on any system, so that was an easy choice, despite how much I like Galaxy 2. Super Metroid, easy. I like Mega Man but I don't love it. It wasn't a key part of my childhood. But Super Metroid, though it's a recent experience for me, is one of the greatest games I've ever played. Galaxy 2 vs. Melee is tough for me. 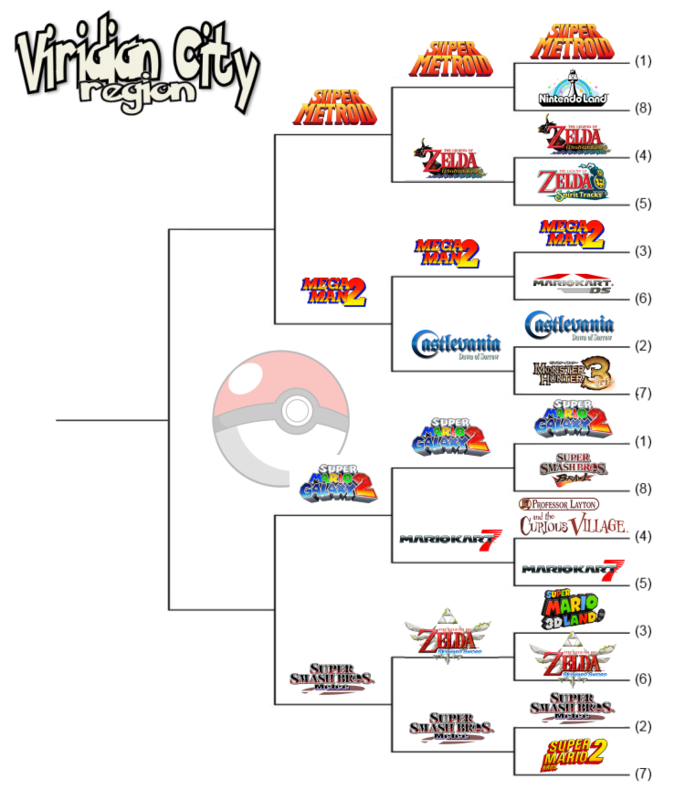 I'm going with Melee because I think losing it would leave a bigger hole in the Nintendo catalog than losing Galaxy 2. But, really, they're within a hair's breadth of each other. Mega Man wasn't a key part of my childhood either. I played through all the games for the first time on Wii. But Mega Man 2 is one of the greatest games I've ever played. Very close call between it and Super Metroid, but its beautiful simplicity and ease of control beats out Super Metroid with its difficult but necessary wall jumping, despite its advantages in atmosphere and influence.